Turtles were given a "head start," grown in captivity for 1-2 years before being released to give a better chance of survival. Western pond turtles used to enjoy a leisurely life. With an estimated lifespan of 70 years, their species spanned the Western United States for millions of years. But along came the Gold Rush, and humans nearly drove the turtles to extinction at the turn of the century. Now, a Sonoma State University biology professor is leading the charge to reintroduce the turtles to their native habitat with a successful collaboration between the university and two Bay Area zoos. On Saturday, 24 turtles were released into Mountain Lake, just south of the Golden Gate Bridge in the Presidio in San Francisco. About 100 people came out to see the turtles released into their new, native habitat after being hatched and raised in the Turtle Head Start program at the San Francisco Zoo and Oakland Zoo. "This is a great opportunity to relocate these turtles to a restored environment," said Sonoma State biology professor Nick Geist, who has been working on the turtle project with the zoos since 2008. "The hope is to establish a resident population as the top predators in the lake's food chain." On Saturday afternoon, SSU biology graduate student Dana Terry donned a pair of waders and measured, weighed and released the turtles, one by one, into their new home. "We are so proud that our collaboration with Sonoma State University and San Francisco Zoo has been able to provide turtles to Mountain Lake," said Margaret Rousser, zoological manager at Oakland Zoo. "The restoration of the lake is such an important project and we are thrilled that the lake will once again have our native Western pond turtles living in it." About 50 turtles were hatched two years ago and raised at both zoos, providing a captive rearing environment to allow the baby turtles, about the size of a quarter when hatched, to grow large enough to defend themselves against birds, fish and other predators they might encounter in the wild. Special transmitters were secured to the backs of the turtles to allow biologists to monitor their progress over the next year or two. After that, the antennae will simply fall off the turtles' shells when they go through their natural molting process. They are also microchipped--just like our furry, four-legged pets--to help identify them for years to come. 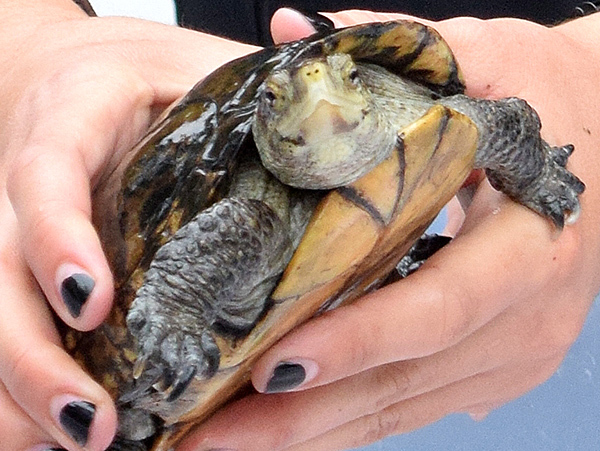 A "soft release" of 29 turtles in Mountain Lake two months ago proved successful, a public release was scheduled to coincide with the Presidio Trust's Science Saturday monthly educational event. Children made turtle crafts, got turtle face paint and even had the chance to meet and touch an adult "ambassador" Western pond turtle from the San Francisco Zoo. "The Western pond turtle's presence is a strong indicator of our ecosystem's health," says San Francisco Zoo Director of Conservation Jessie Bushell, who coordinates the zoo's Western pond turtle species survival plan. "Through our conservation efforts, we hope children will experience the joy of seeing a Western pond turtle in the wild 20 years from now." For years, the lake had been polluted and contaminated by construction, and abandoned pets had grown up in the lake and taken over the habitat. One non-native pet species, the red-eared slider turtle, is a threat to the native turtle population because it is a more aggressive species that feasts on the same diet as the Western pond turtle. The lake has undergone extensive restoration and is now deemed suitable for native species to repopulate. Signs in multiple languages display information about the dangers of abandoning pets in the lake, and point out nearby deposit boxes as an alternative to letting them go in area. Western pond turtles are now the only native freshwater turtle species in the state. They are listed as endangered in Washington and Oregon, and threatened in California. Geist and his team of graduate and undergraduate students have been essential in studying the turtles and identifying opportunities to allow them to thrive once again. "It's up to us to try to bring them back," says Geist. "I can't save all the turtles, but I can help with this species in our own back yard."